How many different types of human garbage, lowlifes, and white trash have worn this shirt over the course of their lifetimes, in order for it to be known in our collective unconscious as a “wife-beater”? Has there been a more widely worn shirt by scumbags in the history of mankind? Think about it- how many pieces of human filth had to wear this shirt in order for it to be so openly associated with the beating of women and carry such disdain that it’s SECONDARY moniker is the “Guinea Tee”. 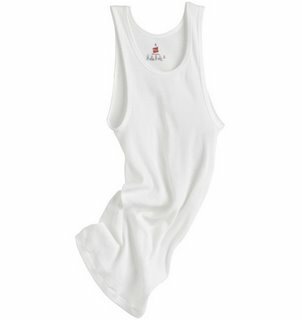 The wifebeater, truly "douchebag wear". "Has there been a more widely worn shirt by scumbags in the history of mankind?" Um. Nazi uniform. Sorry to burst your bubble.